Geek Grotto - Get Your Geek On! : A New Neo Geo MVS Game Coming Out! A New Neo Geo MVS Game Coming Out! NG:Dev.Team is at it again! The dev known for releasing some beautiful games on both the long dead Dreamcast and Neo Geo platforms is back with NEO XYX! 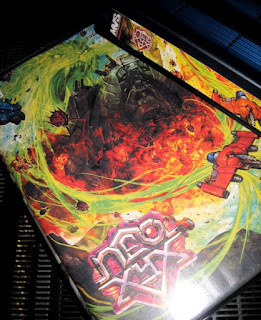 Containing what they say is the first true vertical scrolling shooter on the Neo Geo, it sports hand drawn graphics, a digital soundtrack, and a custom PCB that allows updates via USB!!! We have 2 MVS units in house, but the game is a bit out of our price range!